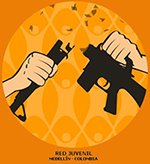 The Medellin Youth Network is a youth organization that operates explicitly on principles of nonviolence. Started in 1990 by young people who had lost loved ones to the armed conflict, the group trains youth in nonviolence and cooperative play, supports young men who refuse to serve with the police, military or illegal armed groups, and promotes respect for human rights and youth’s ideas in Colombian society. A core group of about 30 young people work out of the group’s office and gathering space, a large house not far from the city center. Another 150 youth organized into neighborhood and issue groups are regularly involved in their activities. included processions from the marginalized hillside neighborhoods that ring the city, with music and theater that expressed the participants’ rejection of violence. *FOR accompanied the Red Juvenil from 2005 – 2013. Currently they are not an active partner. For a more detailed history of the Red, click here. Connect through their Facebook. Check out the Demilitarize Your Life VIDEOS.